The industrial conglomerate offered bullish guidance this week that bodes well for its stock performance next year. One of the surprise growth companies of 2017 has been 3M (NYSE:MMM), an industrial conglomerate with a presence in everything from consumer office products to leading high-tech smartphones. It has turned in a strong year so far, and just released impressive guidance for 2018. 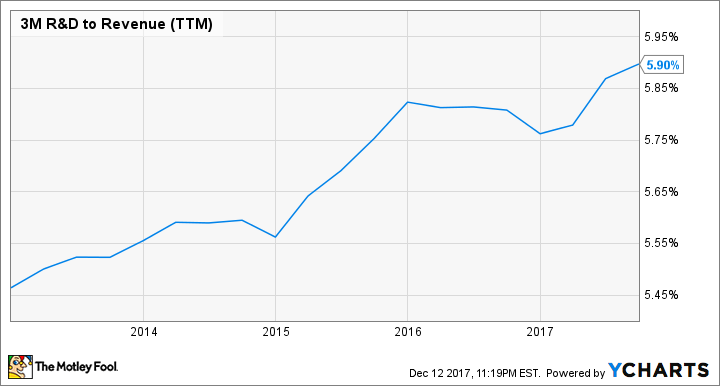 3M isn't going to be a growth stock of the type that Silicon Valley can create, but for the variety of investors who are looking at stocks for steady, solid dividends, and maybe some price appreciation, its performance is incredibly impressive. Management said this week that they expect 2017's organic revenue growth to fall in the top half of the 4% to 5% guidance range, and toward the high end of their previous EPS guidance range of $9.00 to $9.10. Even more impressive, though, is the guidance for 2018: 5% to 7% sales growth with 3% to 5% organic local-currency sales growth. GAAP earnings per share are expected to grow 6% to 10% to between $9.60 and $10 per share. This is a sharp improvement from the extremely slow organic growth the company has achieved since the beginning of the century. 3M highlighted three pillars to its growth strategy. The first is portfolio management, focusing on the most-profitable and fastest-growing businesses. Second is investing in innovations, which I'll get to below. And third is business transformation -- becoming more agile and efficient. "Portfolio management" and "business transformation" are really strategies 3M should employ on an ongoing basis: They boil down to running the business in the most responsible way possible. Examples of this in the past year were 3M selling its electronic monitoring business and its communication markets division or acquiring Scott Safety to fill out the safety product portfolio. But investment in innovation is tangible spending we can measure, and the change on that front is noteworthy. The chart below shows R&D spending as a percentage of revenue, and its rise over the last five years. Management said they expect R&D spending to be about 6% of revenue in 2018, which could keep the current level of organic growth going in future years. What's encouraging about 3M's level of growth, particularly on the organic side, is that it's driven by investments that should continue to pay off for years. R&D spending doesn't boost revenues immediately, but when successful, that work in the lab reaps years of rewards later in the form of new products and expanded market opportunities. As a personal anecdote, I worked at a 3M lab from 2001 to 2005, and I remember scientists talking about OLED displays then. More than a decade later, OLED smarthpones and TVs are the kind of products that are driving growth. 3M's shares aren't cheap, trading at 24 times the high end of 2018 guidance. But if the company maintains a mid-single digit organic growth rate, it could prove to have been a steal at these prices for long-term investors.